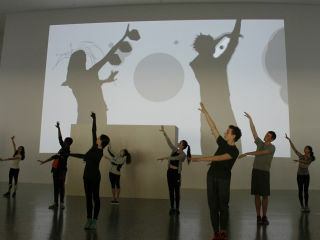 The interactive art experience Shadow Monsters comes alive in a new way as the dancers from Houston Ballet Academy move playfully through the installation in the Museum's vast Cullinan Hall. Inspiration comes from the improvisational nature of the Shadow Monsters computer software, which enhances silhouettes with fangs, fins, spikes, bubbles, and more. Choreographed by Houston Ballet Academy’s Jane Weiner, Academy dancers lead viewers through a journey that unfolds over three phases: first, through the animal/monster sounds from the installation; next, with clapping and vocalization; and, finally, with music.